Seasonal specials come and go, but these contemporary classics are must-order meals that we hope never leave the menu – and they’re all less than $25. The excitement of dining out starts with the anticipation of what will be on the menu. There’s that initial thrill of seeing what’s new, what’s tempting. Still, our eyes instinctively look for the dishes we love, the ones that keep us coming back for more – the crave-worthy ones that tempt us, even when we know we should try something different, the chef creations that draw us back time and again for just one more taste. It’s understandable why chefs rewrite their menus – to reflect the season, to have a chance to experiment with new flavours or simply because they desire change and relish the opportunity to put something new on the plates of their diners – but these are the dishes we hope will always be ready for us to order. 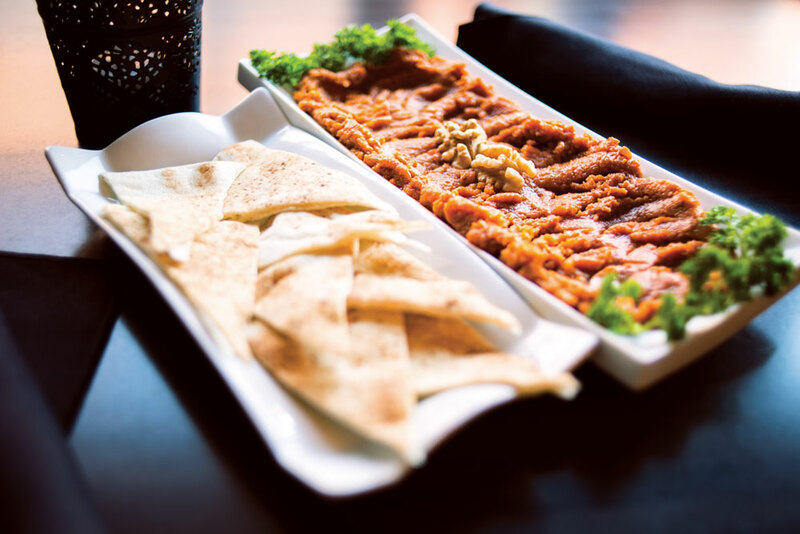 Made with roasted red pepper paste, walnuts, onion and pomegranate molasses, the Mouhammara at this family-run Lebanese restaurant is legendary. It’s served drizzled with olive oil with soft pitas for scooping. It’s a tough call because the lure of the signature gochujang wings is strong, but the crispy tofu is the must-order here. The soft tofu is the perfect foil for the crispy coating, while the kicky kimchi, soft and salty pieces of pork belly and drizzle of citrus aioli bring it all together. Who needs bacon and eggs when there are Merguez N Eggs to be had? The earthy and spicy sausage and soft-poached eggs are nestled into a pan of stewed tomatoes and topped with a dollop of tangy yogurt and diced preserved lemon that bring some brightness to the dish. 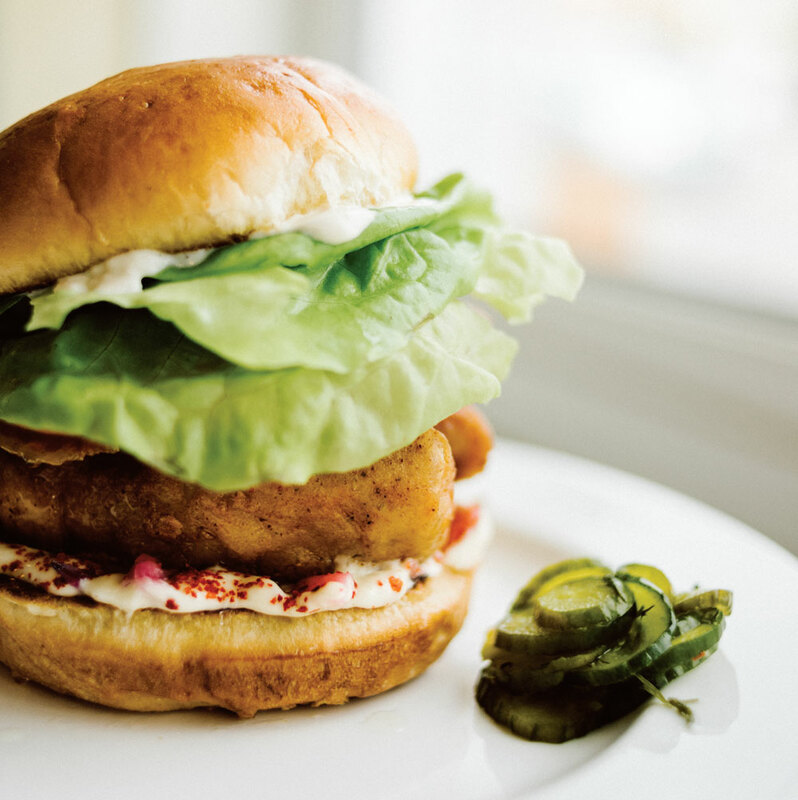 A fried-chicken sandwich makes for a pretty good meal. One cooked sous vide so it’s juicy and tender, then breaded in a gluten-free batter, fried and topped with pancetta and a drizzle of honey – not to mention pickled onions for some tartness – is a damn fine one. And there are no piddling portions here; the bun can barely contain all the fried-chicken goodness. Order the pizza, of course. And maybe a plate of pasta to share. But start here with the beef and veal meatballs. Saucy, spicy, big and boldly flavoured – yet tender – they’re what most meatballs aspire to be. An American classic with a certain French je ne sais quoi from chef Xavier Lacaze, the burger from Brigg’s has pure beefy flavour from two juicy patties, contained – along with cheese, a tasty sauce and the usual fixings – in a soft, but sturdy egg bun. 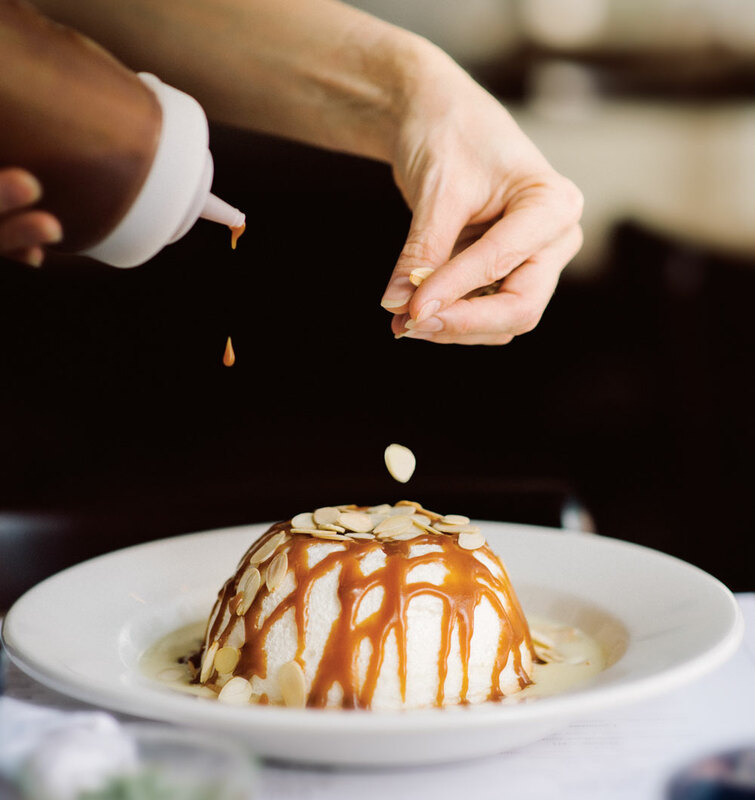 The menu at this French bistro changes often, so when you see le flottante you know you are having dessert. A sweet, cloud-like meringue floating in a pool of crme anglaise (hence the name, floating island) with caramel drizzled over top, it’s so light, there’s always room for it. The pistachio and avocado bruschetta at Charcut’s sister restaurant is what avocado toast aspires to be. Meltingly soft avocado is generously topped with crunchy pistachios and splashed with oil to be smeared onto lightly charred pieces of Sidewalk Citizen bread. The smooth richness, with the crunch of toasted bread and nuts make for an incredible starter. 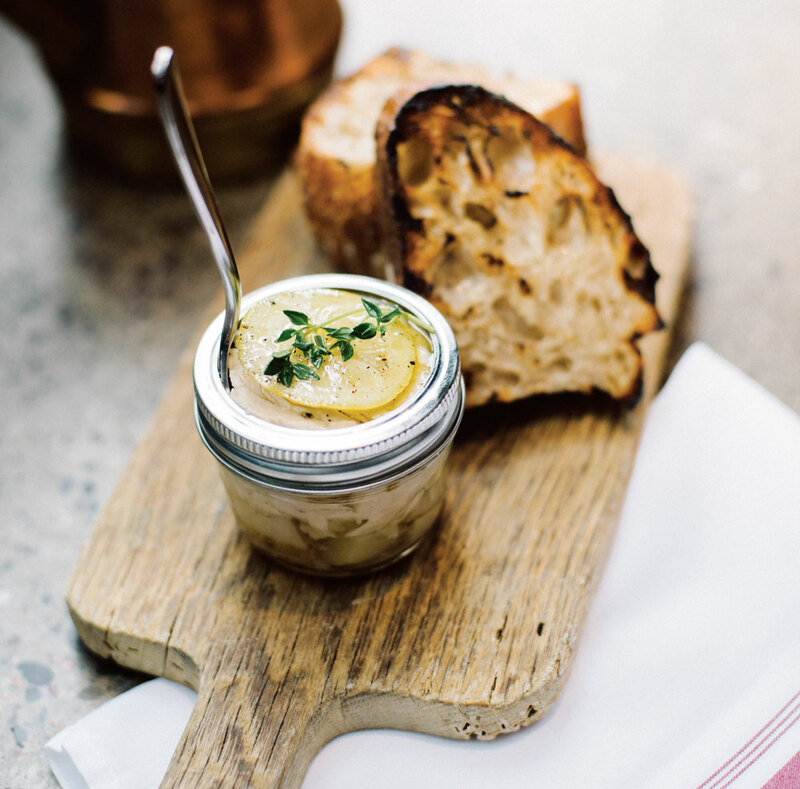 A playful take on canned tuna, Charcut’s tuna conserva elevates simple ingredients into a well-balanced appetizer. Cooked confit, the tuna is rich and flavourful, while the slice of lemon served atop and pickled potatoes buried below offer the perfect counterpoints. The slices of Sidewalk Citizen sourdough are a nod to the simple sandwich, but, instead of hoping to trade it for someone else’s lunch, you’ll be fighting for the last bite. Save your fork, there’s pie. Also, save some room because the M.M. Apple Pie is no thin sliver or fancy deconstructed dessert. This is a good, old-fashioned, healthy-portioned wedge with a cheddar crust and a dollop of ice cream capping off the crumble topping. Putting toppings on burgers is boring. Putting toppings in burgers is so much better. That’s why we’re drawn to the half-pound stuffed burgers at this gem of a mom-and-pop shop (minus the pop). Just about anything can get stuffed into the centre of a juicy, well-seasoned, beefy burger and chef-owner Erin Mueller isn’t afraid of getting creative with her concoctions. We are not saying don’t get the tacos. Definitely, get the tacos. Just order them alongside the Hamburguesa. Two beef patties, two slices of cheese, pickles and onions on a sesame bun may sound familiar, but owner Cody Willis’s version of a burger is so much greater than the sum of its parts. Juicy, well-seasoned and completely craveable. Have napkins handy. 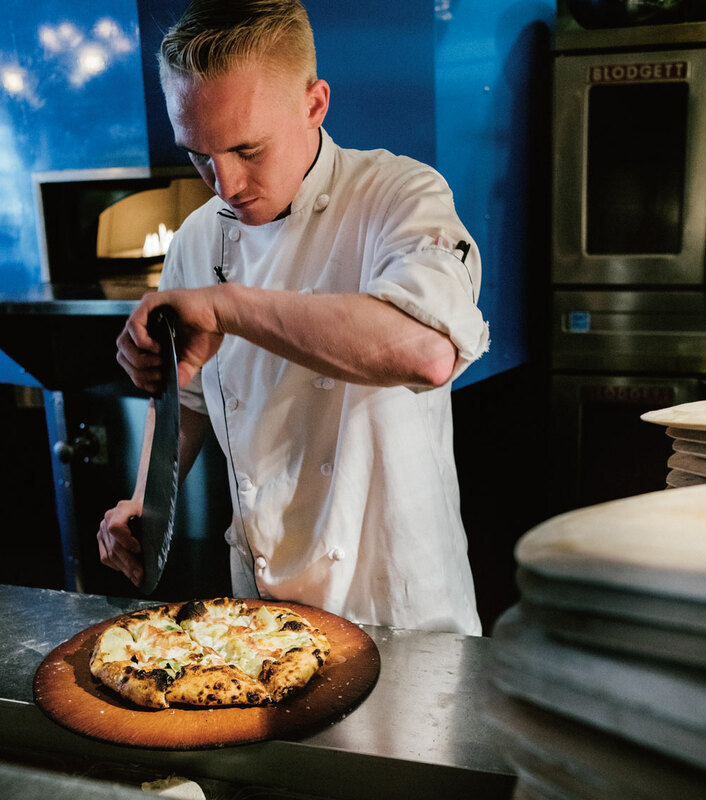 Chef Justin Leboe’s small-plates hot spot prides itself on a seasonal, ever-changing menu, but we’re grateful that we can usually find the nori crumpets with shrimp butter on the list. When spread on immediately, the decadent shrimp butter melts into the crevices of the warm, crisp-edged crumpets, so don’t wait long to dive into this dish. Save the red sauce for another time because the potato and leek pizza should not be passed over. Thinly sliced potato pairs perfectly with soft leeks and a crme fraiche base, while the pancetta adds the saltiness and smoke that brings us back for more. A recent overhaul of the food menu at this hot cocktail lounge had us worried, but the best dish of the bunch made the cut, to our delight. In the event that they don’t survive the next round of cuts, order several pork belly steamed buns whenever possible. We like the combination of flavours (rich pork belly and spicy kimchi on the pillowy bun) and the do-it-yourself assembly. 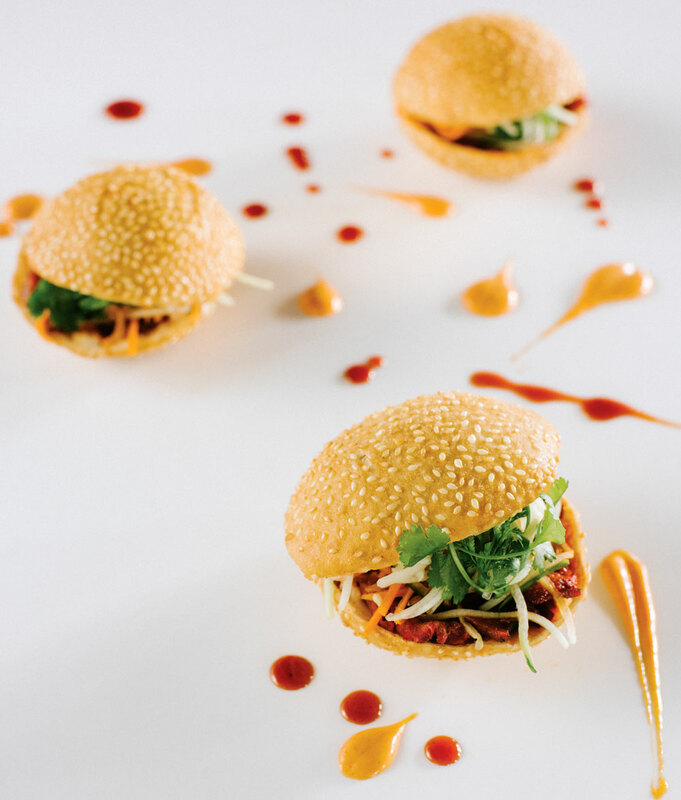 Like an Asian-fusion cross between a slider and a bao, the char siu sesame doughnut brings together soft pork shoulder with the hot and sour flavours of pickled vegetables and a sriracha aioli, all nestled into a light and sweet sesame bun. Just so you know, you’ll probably want more than one. 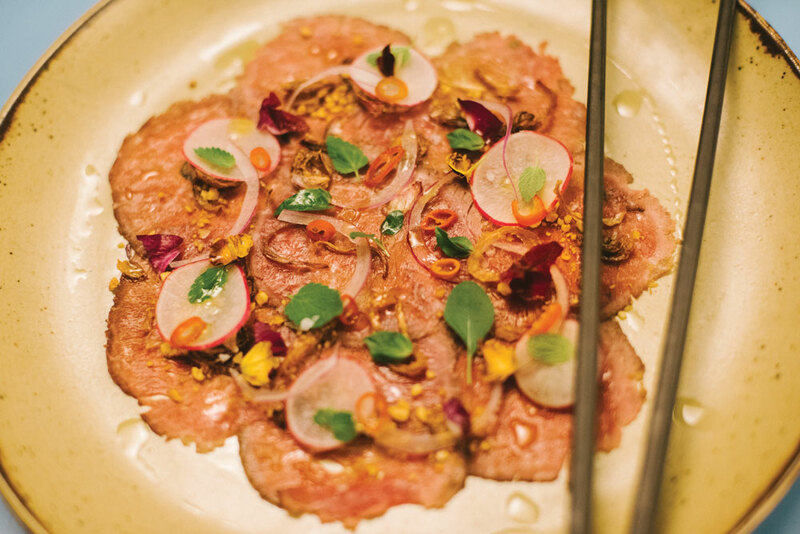 The only traditional part of the heritage beef carpaccio dished up at Hotel Arts’ viet-modern restaurant is that the base of it is paper-thin slices of tender beef. Beyond that, the otherwise standard dish gets a massive, addictive makeover with herbal hits of Thai basil, spicy chilies and a citrus-enhanced nuoc cham poured over. A comfort-food classic, carbonara satisfies the craving for something warm, soothing, rich and, well, full of bacon. Scopa’s version of spaghetti alla carbonara, however, raises the bar with a little heat from chilies and a tiny hint of lemon that cuts the richness nicely. The broth at this Bridgeland ramen joint is enough to keep us coming back, but combining that rich soup with the pork-laden, umami goodness of the chili goma topping that melds with the noodles and broth is what pushes us to persevere through the inevitably long lineups. It’s the heat that sets Sugo’s Caesar salad apart from the standard. 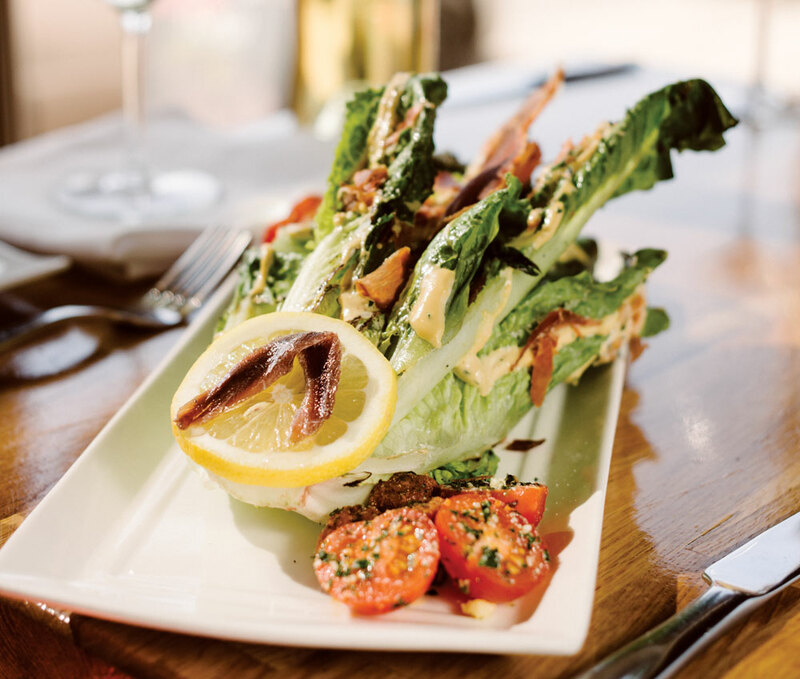 The Inglewood restaurant grills the romaine, giving it a slight char and depth of flavour that straight-from-the-cooler lettuce just can’t match. The spicy dressing and crisp prosciutto round out the salad perfectly. There’s something quintessentially French about the combination of cheese and ham and egg. Folding these three into a buckwheat crepe known as a galette simply enhances the combination, which is why it’s nearly impossible to stray from ordering the Complte at Suzette. Ordering dessert is mandatory here with the butterscotch pudding on the menu. 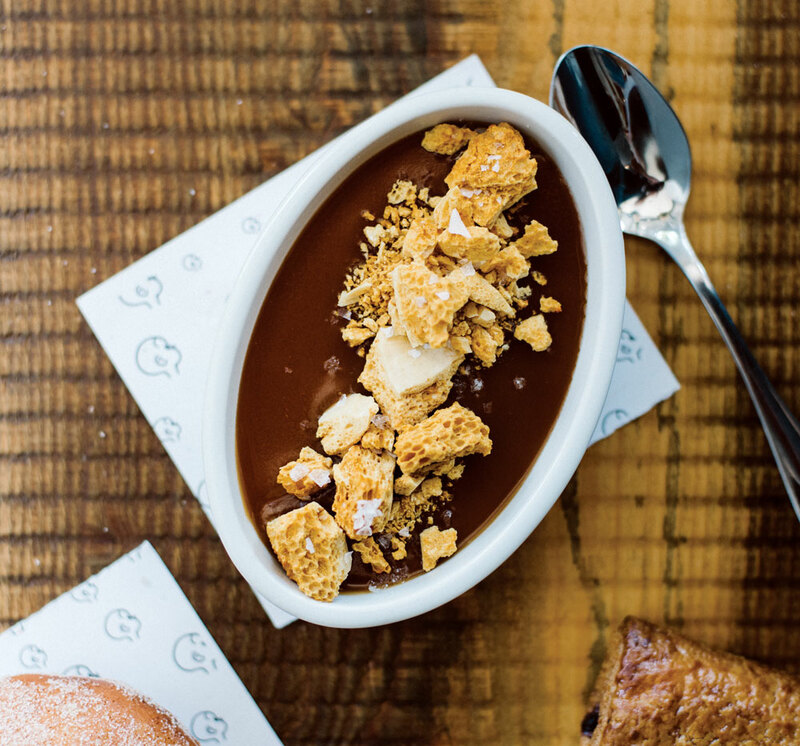 Over-the-top decadence takes the form of a salty-sweet rich and smooth pudding, scattered with flaked salt and sponge toffee. It’s even large enough to share without feeling like you’re being virtuous. 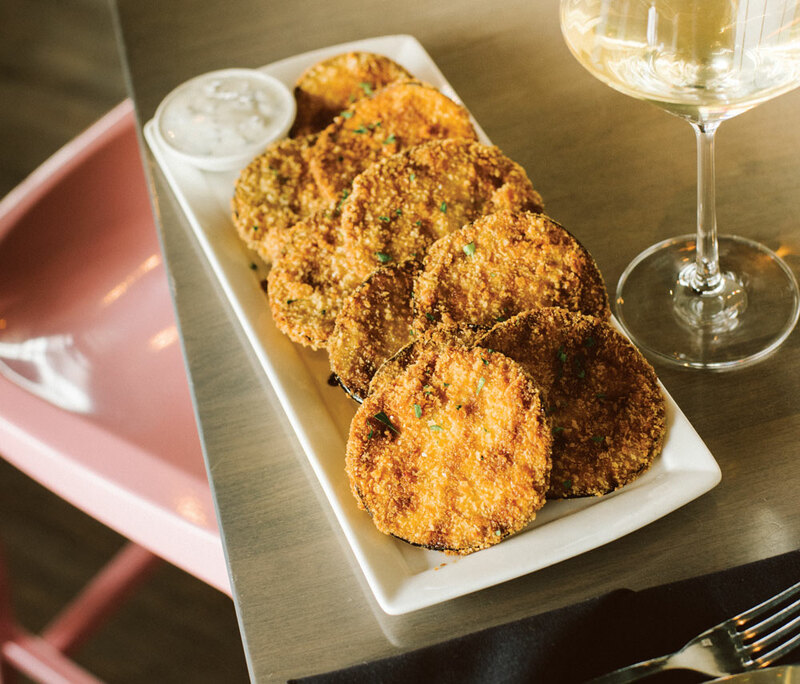 The wine list is always going to be the draw at Vin Room, though no visit to either the 4th Street or far-west location is complete without an order of eggplant chips. Thinly sliced and fried until crisp and golden, then drizzled with a tart and tangy pomegranate molasses to cut the richness, they’re the ultimate snack. Pizza is inherently crave-worthy, but even more so when the pie is the Hutch from this second-floor Inglewood pizzeria. The hand-stretched crust gets decked out with sauce and spicy salamis that are slightly mellowed with the pepperonata and mozzarella. If you can handle a bit of heat, this is the pie that should be on your plate.